Unfortunately, death is a part of life and a part of life in the church. It is important to show sensitivity to surviving family members yet honor the deceased when keeping their memory alive. A church directory is a tool that can be used to remember the deceased in a respectful and honoring way. Death is traumatic for the surviving family members. 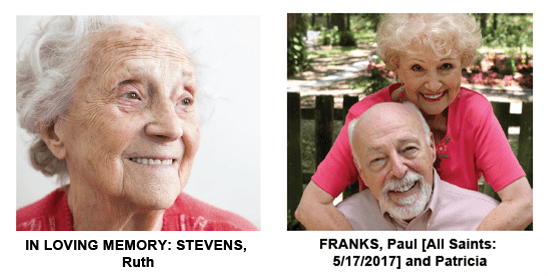 When a spouse or child passes, after period-of-time, it is important to ask the surviving family members how they would like to see their family in the directory. Would they like to take or submit another picture or keep the one they already have? There is no correct answer as each situation is unique. Some members will want to include a photo of their loved one, and other families may find it too painful. With online church directory programs, you can change the photos and family information immediately, and some families may wish you to do so. Update the Family Details to Include “In Memory” or “All Saints”. One option to honor the deceased in your church directory is to simply add “In Memory” or “In Loving Memory” before the member’s name. Another way to pay tribute is to include the date of passing next to their name in the directory. Including this information may work well for older couples whose spouse has passed away and is also helpful for other members to remember and honor widows and widowers among the congregation. For your online directory, for a widow or widower, you may want to consider removing the address, phone, and email address immediately; or, update the address and email to the appropriate person where condolences can be sent. 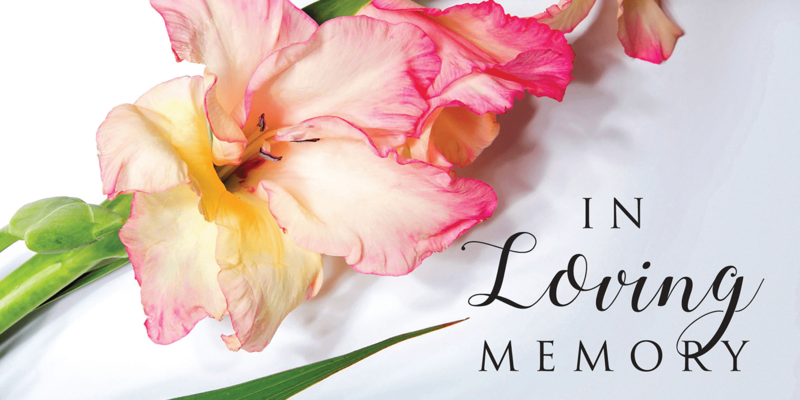 Create an “In Memory” Page for a Loved One. 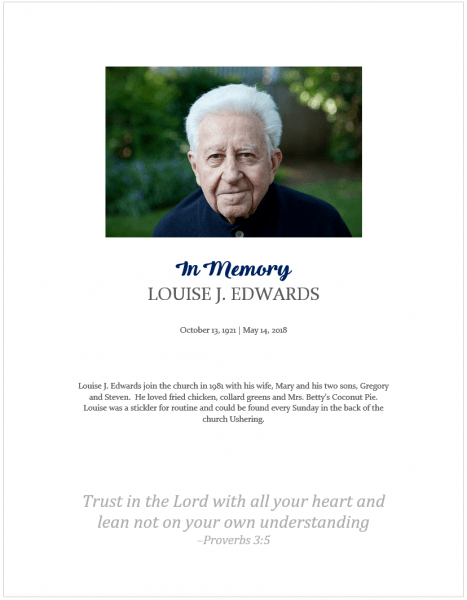 You can create a special “In Memory” or “In Memoriam” page that includes additional information about a deceased member’s life and work in the church and choose to feature each member with a page of their own in the directory. Something to consider: you may not want these special pages to read exactly like a newspaper obituary; but, create them to be a testament to their life as a Christian and their work and contribution to the church. What was this person known for within the church? What special qualities and unique abilities set them apart? What was their favorite Bible verse? Did they teach Sunday school? Did they sing in the choir? Did they work in children’s or youth ministry? Were they an elder, deacon or hold other spiritual leadership roles in the church? On what committees did they serve? Of course, include any other family details you wish. To further enhance this special page, include a larger photo of the deceased member. If you are using an online directory, some programs will allow you to add an additional note under each member. This is a great place to add a note about the member who has passed away. Example of using the “Additional Notes” field on Instant Church Directory’s online member directory. Create a Dedicated “In Memory” or “All Saints” Roster Page. If you have a directory program that allows you to create a PDF or printable version of the directory, this gives options to honor a life well-lived in a few different ways. 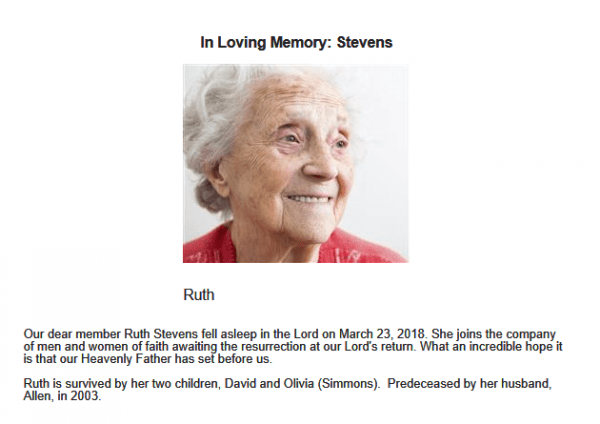 Many churches have chosen to create an “All Saints” page or an “In Loving Memory” page dedicated to those loved ones as you honor their memory. You can include members who have passed within a particulate time frame (1 year or last 5 years) or continue to keep their memory included for as long as you choose. Such a page may be as simple as including a photo of the deceased along with their date of birth and date of death, like the suggestions made earlier for the family and roster pages. 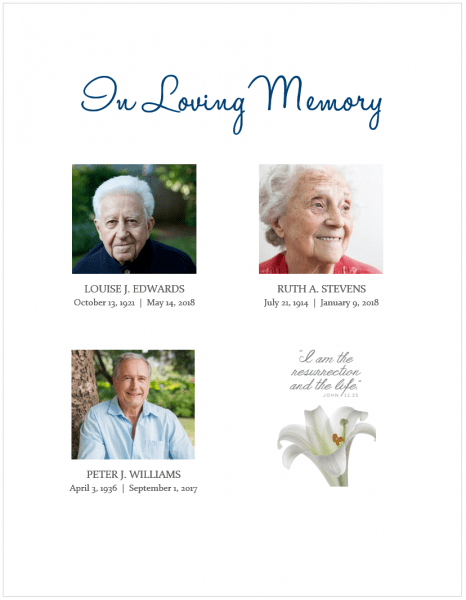 For online directories, consider creating an “In Loving Memory” Group or “All Saints” group to create a similar roster page within the directory. Remember that the church is a family and although the topic can be sensitive and emotional, remembering deceased members within the church directory is a way of honoring their memory and contributions to the church. Having a plan in place to do this as you prepare your directory will make it easier on the surviving family members going forward.